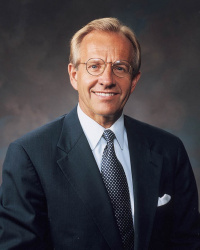 William Craig Zwick was a general authority of The Church of Jesus Christ of Latter-day Saints, having been called to serve in the First Quorum of the Seventy on April 1, 1995. He was released and given emeritus status on September 30, 2017. Zwick has served in many positions in the Church, including as president of the Chile Santiago South Mission (1989–1992) and as a missionary in the North Argentina Mission, where Richard G. Scott was one of his mission presidents. Zwick was born on June 10, 1947, in Salt Lake City. He earned his bachelor’s degree in business management and finance from the University of Utah, then worked for his father’s construction company, Zwick Construction, where he later became the owner and operator until his retirement in 1989. Zwick Construction has completed many jobs for the Church, including the Family History Library, the Museum of Church History and Art, the Temple Square South Visitors’ Center, several meetinghouses, and the Chicago Illinois Temple, the Portland Oregon Temple, and the remodel of the Bountiful Utah Temple. Zwick also worked for three years as executive director of the Utah Department of Transportation and on the board of directors of the Associated General Contractors of America. He has served on a few boards, including the University of Utah Alumni Board and the Utah Symphony Board of Directors. Zwick and his wife, Janet, are the parents of four children. This page was last edited on 3 October 2017, at 12:17.